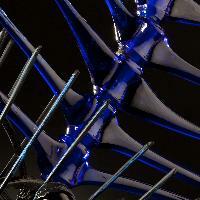 Densaburou Oku is presenting a new group of sculptures at the Mary Martin Gallery November 2. 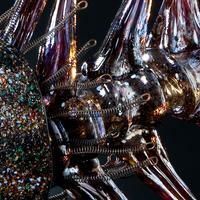 Densaburou will take metal items from your craft, career, personal life and turn those into an amazing sculpture for you. Imagine a restaurant serving fish with a centerpiece fish sculpture, or a dentist with his tools welded into the fish's head and fins, a chef with his array of implements arranged into a shark's head, a fisherman with a swordfish made from fishing rods, a ship's captain with a fish made from those items found on ships or boat's, a computer person with a fish made from silicon chips and glass, a plumber with a fish sculpted from pipes and fittings, a sculpture from Grandmother's silver or stainless. The ideas are endless. 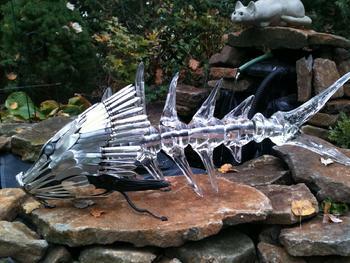 Show your creativity and let us know what your fish would be made from. Baby Fish # 1 Length 22" Height 10" Width 5 1/2"
Baby Fish # 2 Length 27 1/2" Height 16 3/4" Width 10 1/4"
"Orange Glass Ginzaki" Length 36" Height 20" Width 11"
"Buri 2" Length 46" Height 29" Width 16 1/2"
"Chosame" Length 53" Height 30" Width 14"
As a recipient of a Wheaton Arts Fellowship in both 1993 and 1994, Densaburou was given the opportunity to study at the Creative Glass Center of America in Millville, New Jersey. This experience helped further his skills and his unique vision as a sculptor. 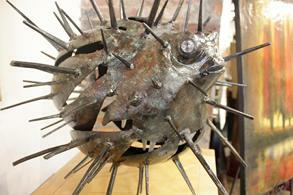 His mixed media fish sculptures are created with glass, steel, found objects and paint. 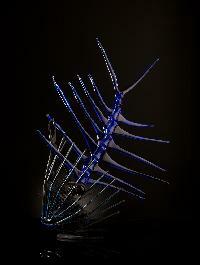 He uses steel elements and found objects to create the fins and head and then combines these with segments of blown and cast glass that are assembled to form a skeleton-like structure representing fish bones. His work combines great skill and an unusual, lighthearted approach to his subject.